Want to navigate the downtown scene or explore the road less traveled? Wherever you’re looking to go, the Permobil M5 is built for your lifestyle. By fusing sleek design, unparalleled power and the FlexLink Pro dynamic suspension, each M5 delivers an outstanding level of performance and ride comfort. Perfect for every adventure! Experience unsurpassed stability and comfort from our unique suspension geometry and linear spring design that is paired with our patent pending FlexLink™ Suspension for advanced vibration reduction. For even more comfort the M5 Corpus debuts the FlexLink Pro for first-in-class independent drive wheel suspension. In the tradition of high-performance motors and gearboxes, the M5 takes control with a 7.5 mph motor package and superior torque. 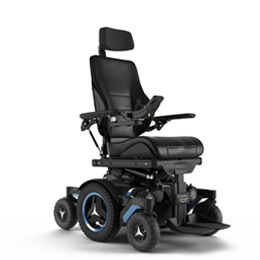 Coupled with a 14″ seat elevator that maintains full suspension at any seating position and drive speed, piloting the M5 Corpus will help you take an adventure to a new level. The rubber meets the road with our 8″ aggressive or standard caster options. The M5’s adjustment-free flutter damping device enables an intuitive driving experience even with a wide variety of drive controls. Finally, mid-wheel drive performance that lets you pivot like a pro.